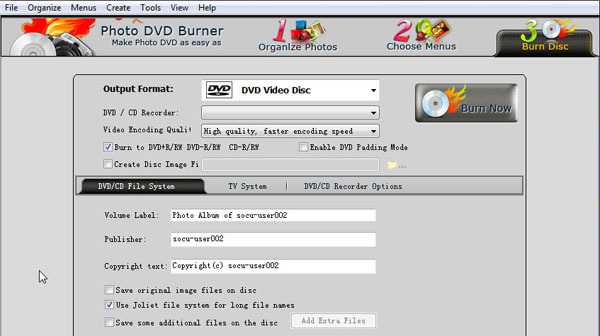 Photo DVD Burner is a professional photo DVD slideshow maker, it can help you create a professional photo video with background music, dynamic transition and Pan&Zoom effects,kinds of Album themes and eye-catching DVD menus. Also it enables you to add text to express your feelings. With Photo DVD Burner, you can create a photo slideshow and play it on TV with DVD player, you can share your photo music slideshow on YouTube,Facebook, Myspace or other social sites, or enjoy the slideshow on iPad, iPhone, iPod, PSP, PS3, Creative Zen, Archos and more mobile devices. The program allows you to add background music from 3 ways: 1,Insert music from your computer hard drive.2,Import music from Audio CD.3,Record sound from various input source.For one slideshow, you can add one or more background songs, or trim one song to play specified part of music. Photo DVD Burner can output slideshow in different video formats, including mp4, 3gp, flv, swf, mpg, avi, mov, mkv, even HD video. Also you can burn the photo slideshow to DVD/VCD/SVCD/Blue-ray Disc. You are allowed to customize the parameters of different output formats. You can create a photo slideshow with only three major steps, Organize Photos, Choose Munus and Burn Disc.In step 1,you need to import photos, edit photos, add text, choose background music and transitions, choose Album theme. 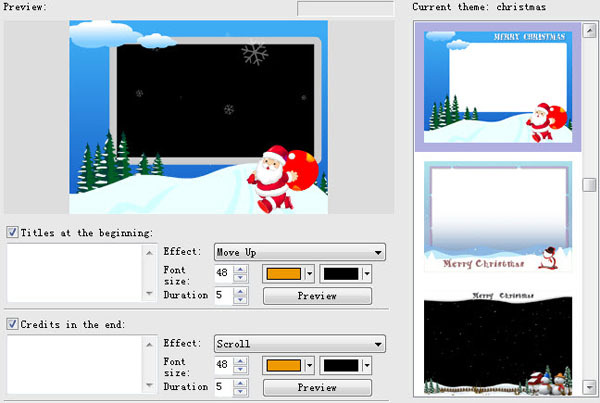 In step 2, you can select a DVD menu and set it,such as background music and image etc. In step 3,select the output format and burn/convert the photo slideshow. "Photo DVD Burner is good software, my job is creating various photo slideshow for people,thanks to this software, I can always make a satifying photo slideshow DVD and other slideshow videos. It helps me much."